If you look under the hood of industry leading organizations, you’re likely to discover efficient and metrics-driven inside sales team. To achieve success in inside sales it takes grit and passion. Those who continuously optimize their sales processes and truly understand their customer’s needs will rise above their competitors. At the intersection of art and science, inside sales serves as an “engine of growth”, a key revenue driver when done effectively. In this webinar, you will hear from our experts on the **processes**, **people,** **systems** and **implementation methods **they have used to achieve success. Would you like to improve sales performance, grow your active pipeline, increase calls made and meetings booked? Would you like to increase logging of new contact information and improve the overall usage of your CRM? Gamification for Salesforce can help you do just that by fostering teamwork, collaboration, and a healthy level of competition within your sales organization that will ultimately boost the performance of your sales team. 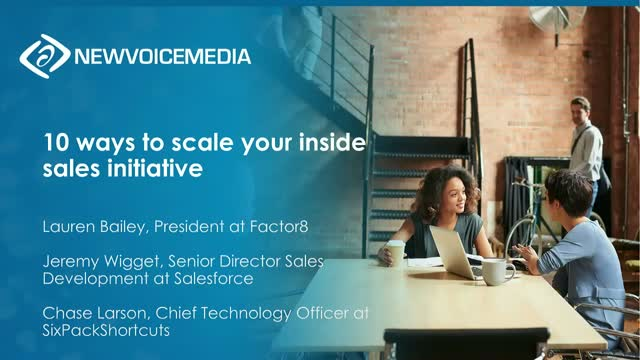 During this webinar you will see a live demonstration of NewVoiceMedia Motivate working alongside Salesforce Sales Cloud and NewVoiceMedia ContactWorld for Sales. Ever wonder how an inside sales software company uses inside sales software to improve sale performance? Here at NewVoiceMedia, we drink our own champagne by using ContactWorld for Sales and our sales gamification application, Motivate, to understand what makes our top performers successful. Using those insights, we are then able to onboard new reps faster and improve the performance of lower performers while gaining clearer insights into the health of our sales opportunities. As part of our Summer Release, we’re unveiling several major product enhancements that will help sales and service teams have more personal phone conversations using the information they have stored in Salesforce. We are also introducing new features that will help you improve your team’s performance while enhancing the experience your customers and prospects have when they engage with your sales and service teams. o Discover enhancements to the way administrators can create call flows, manage skills and easily access data in Salesforce to inform and resolve customer contacts. o Learn how integration with Salesforce Omni-Channel Presence enables the two platforms to work together to prioritize the delivery of multichannel interactions. o Find out how we’ve automated the process of presenting the correct local number, speed up outbound calling and significantly increasing the call answer rate. It will also be easier than ever to set up and maintain dial lists in ContactWorld. o See how ContactPad now aligns with the Salesforce Lightning aesthetic, giving it a modern, refreshed design. o Find out how we’ve improved the user experience in the dialer, putting frequently used features at the agent’s fingertips. o Learn how we are enhancing WebRTC, enabling calls to be delivered in EMEA as well as in North America. Is Sales Productivity a top initiative for your team this year? You’re not alone. Many companies are turning to Salesforce for this reason to consolidate systems and accelerate the deal process. While Salesforce can definitely help your team sell smarter and faster there are huge productivity benefits for integrating two solutions with Salesforce: Telephony and Configure, Price, Quote (CPQ) technology. By integrating your phone system with your Salesforce CRM, your sales organization can benefit from a considerable surge in the number of prospects they connect with each hour of every day. But it’s not just about getting a prospect on the phone, it’s also about how effective they are at turning a conversation into a sales opportunity. By using the information you already have in Salesforce to personalize each interaction, your reps will be able to develop your sales pipeline more rapidly and ultimately book more revenue. Join Chad Wilbourn, Senior Sales Manager at Six Pack Shortcuts, as he discusses 5 tips to building a killer sales team and streamlining your business in 2016. Chad will specifically define how to solve your sales challenges through effective processes, technology, and systems. You will leave this webcast with practical and proven tips to improve your inside sales team’s performance.